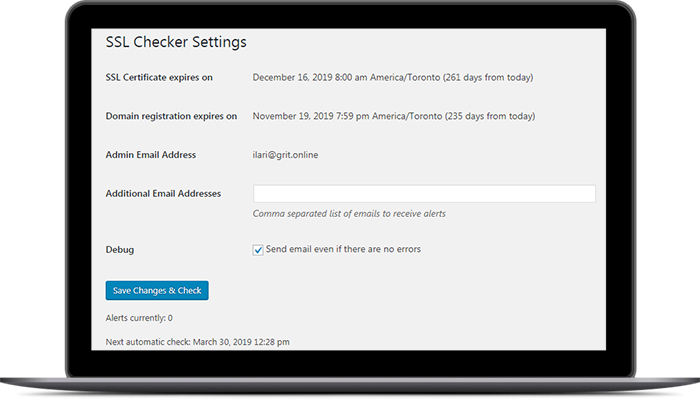 SSL Checker verifies site SSL certificate and domain expiry dates, and alerts site admin via email before the SSL certificate or domain expires. Do note that domain transfer must be initiated more than 15 days before the domain expires, if that’s something on your task list. The plugin is basically install, activate and forget, until the alerts start coming in. The alerts and respective expiry dates are visible in the admin menu as well. How often is the check done? Edit settings options as required, and save changes. 1. Upload ‘ssl-checker’ folder to the ‘/wp-content/plugins/’ directory. 2. Activate the plugin through the ‘Plugins’ admin menu. 3. Edit settings options as required, and save changes.